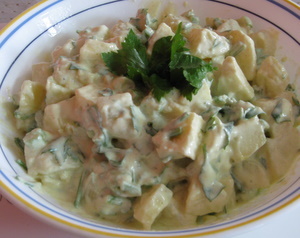 A Healthy Potato Salad Recipe to enjoy potatoes in your meals. Eating fried potatoes is a very popular but unhealthy way to incorporate them in your diet. So they must be avoided as far as possible. Boiled potatoes, on the other hand are good for us but sometimes their taste does not appeal to everyone. Try this Salad Recipe and you will enjoy even boiled potatoes. The added crunch from celery, apples and walnuts just makes this recipe...simply delicious. To top it all, it just takes mere minutes to prepare this salad. Can it get any better??? Yes, it can. The mayonnaise dressing we use for this salad is also HEALTHY (Egg less and low fat). Cut the Potatoes, Apple, Pear and Celery into more or less equal size pieces. Combine the apple and pear pieces with lime juice as soon as you cut them (to prevent from coloring). Put the ingredients in a bowl and toss well. Add the mayonnaise and fold so that everything is coated well. Adjust the quantity of the mayo to taste. Sprinkle the walnuts. Garnish with some celery leaves. The healthy salad is ready. Tuck in right away or refrigerate for a while to eat it cold.